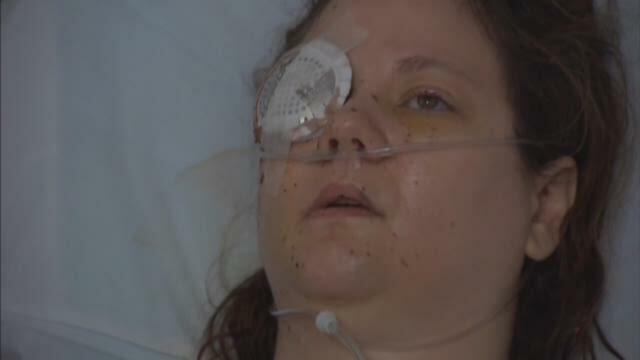 With a patch over her right eye and with her husband at her side at PeaceHealth Southwest Medical Center in Vancouver, Monday, Abigail Mounce described the moment she was shot in the face. VANCOUVER, Wash. - With a patch over her right eye and with her husband at her side at PeaceHealth Southwest Medical Center in Vancouver, Monday, Abigail Mounce described the moment she was shot in the face. "And, then all I hear is ringing. He had shot me in the face," Mounce said. It happened at around 8:30 a.m. Friday. Abigail and her husband had left their home moments earlier and where at a stop light at 63rd and Andresen when they said their neighbor, 59-year-old John Kendall, pulled up next to their car leveled a rifle at them and opened fire. "All I remember is seeing the barrel," Mounce said. "I don't remember seeing anything else." She said a bullet struck the right side of her face and will likely result in the loss of her right eye. The 33-year-old also said she underwent reconstructive surgery on her cheek. Abigail's husband, Erich said an investigator told him that they recovered 17 shell casings at the scene. He escaped unharmed, and rushed his wife to the hospital. "I don't know how we got that through that, that's a lot of bullets," he said. Investigators have yet to release a motive for the shooting, but record show that he Mounce's and Kendall where in an ongoing dispute over rules for their subdivision. The Mounces had asked Kendall to stop subleasing his property to other tenants, and to take down tarps and sheds in his back yard, among other things – all violations of neighborhood rules. After the shooting, Kendall fled the scene prompting a manhunt that ended a couple of miles south of the shooting scene, when an officer spotted Kendall's car. In a strange twist, as heavily armed officers moved in, they said they encountered a different armed man who they shot in the leg. Police have yet to release that man's identity or say what prompted them to shoot him. But they said he was not connected to the original shooting. Police later found Kendall nearby deceased from what appeared to be a self-inflicted gunshot wound. "I'm sad," Abigail said of the situation. "I'm said that he (Kendall) felt the legal issues that we had with him had to culminate in this ending." For now, Abigail remains in the hospital and faces a long road to recovery. In an effort to help offset some of the mounting medical bills her family has set up an account in her name on the website, gofundme.com. "I just want people to know I'm getting better every day," Abigail said.